This week I fished five days in a row, prospecting Hein Bank, Eastern Bank, Protection Island and Diamond Point, inside Discovery Bay. The two banks failed to reveal any bait or blackmouth, while Protection Island did have bait and some nice salmon during the ebb tide. Thursday morning when I launched at John Wayne Marina, the plan was to look for bait at Protection Island and fish if the sounder revealed bait and or blackmouth. Nothing showed on the screen, prompting me to head toward Diamond Point. My fishfinder revealed bait and blackmouth within seconds. Both 15 pound downrigger balls soon skimmed to within a few feet off bottom, with F4 Piscator flashers and size #2 Kingfisher spoons tied to 40 inch leaders. 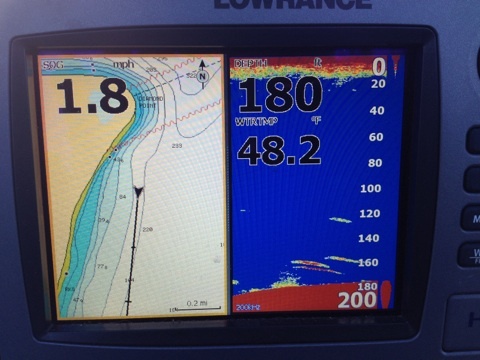 Trolling with the tide and staying between 140 to 180 feet did the trick. On the third pass trolling south with the tide, the starboard side downrigger started dragging the bottom followed by a hard hit that released from the clip. Discovery Bay Blackmouth fishing with Silver Horde F4 Piscator flashers and size #2 Kingfisher spoons. A few minutes after landing the 29 inch deep shouldered, adipose clipped blackmouth, we began trolling along the same depth contour. Again, as soon as the ball scraped bottom another fish hit, released from the ‘rigger but shook off the hook. This fish also had an embedded tag in its head, which will eventually tell me where it came from. Ryan the fish checker took the head and will turn it into the lab, along with scale samples. Within two months a notification should arrive by mail with details of which hatchery this fish came from. When I cleaned the fish it had four inch candlefish in its belly, which explains why the salmon are so close to bottom — they love picking at the bottom where candlefish hide. During candlefish spawning times, Chinook salmon often have scraped up gill plates. This fish also had immature egg skeins. Trolling to the east into the steep bottom revealed more blackmouth feeding on the bottom. 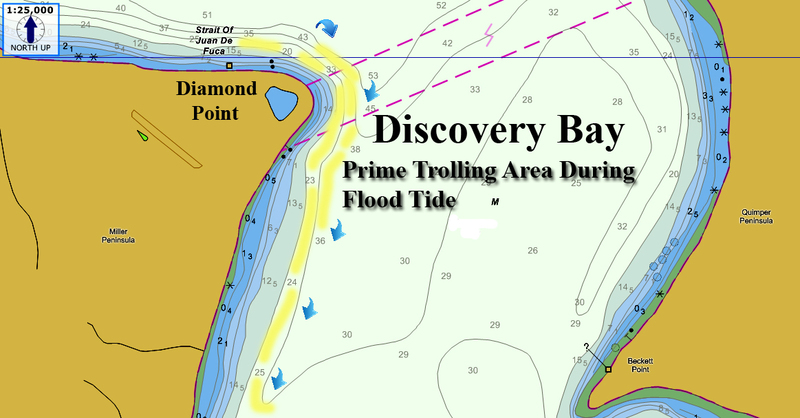 As the flood tide progressed my troll pattern took me farther inside Discovery Bay, just past the bluff which sits south of the homes at Diamond Point. We also noticed lots of fish on the edges, where the bottom drops off the contour line. 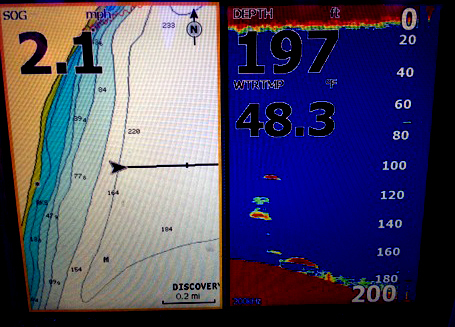 Take a look at these images of my fishfinder as we trolled the area. 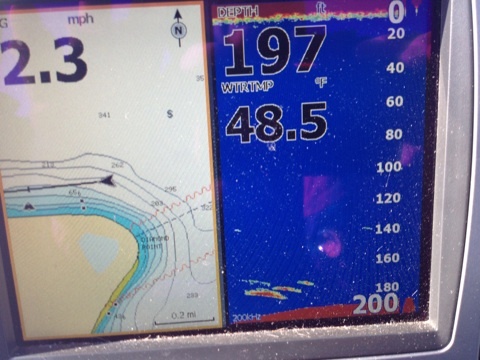 After the tide turned we began trolling back toward Rocky Point and continued to mark salmon feeding on bottom. Jiggers and moochers also catch fish in this area. My first time fishing this spot was with a Dungeness Stinger. 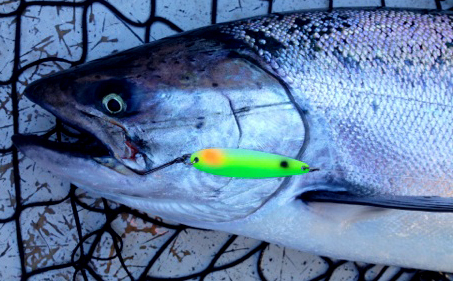 The trick, like most areas, revolves around locating bait or those BIG, beautiful salmon marks near bottom. 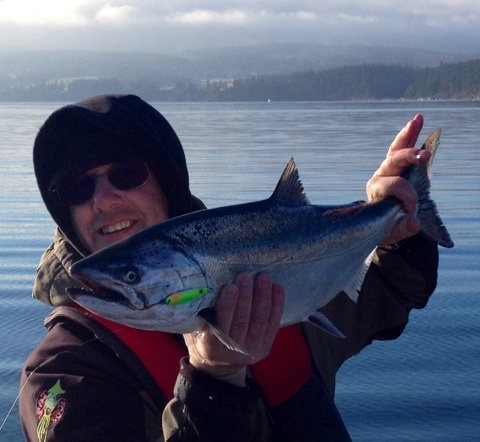 This entry was posted in Salmon Fishing Maps, Salmon Fishing Tips & Tricks, Washington Salmon Fishing and tagged Diamond Point Salmon Fishing, Diamond Point Salmon Fishing Map, Discovery Bay Salmon Fishing, Discovery Bay Salmon Fishing Map, How to Catch Chinook Salmon, How to Catch Winter Blackmouth, How to fish Diamond Point, How to fish Discovery Bay. Bookmark the permalink.